If your kid has a sweet tooth for numbers then this worksheet is perfect for her. On a limited budget, how much candy can one kid afford? To get through this worksheet your kid will need to use simple addition and subtraction. 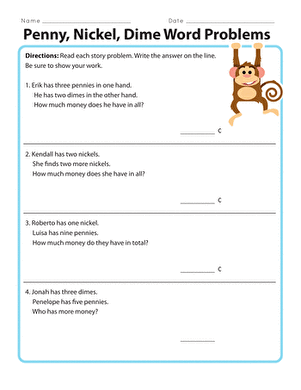 First, she will need to count the coins at the top of the worksheet to discover how much money she has to spend at the penny candy store. She'll then need to decide how much of each type of candy she can buy with the money she has. Which type of candy is the best buy? Your money savvy first grader is probably an expert at recognizing pennies, but does she know what the back side of a penny looks like? 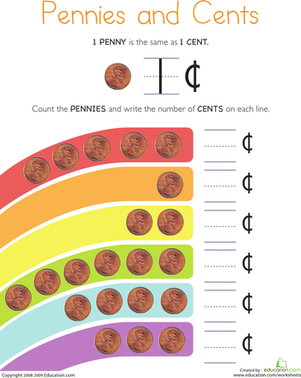 Kids learn the appearance and value of pennies, count pennies, and write the number of cents for the pennies on this first grade math worksheet. 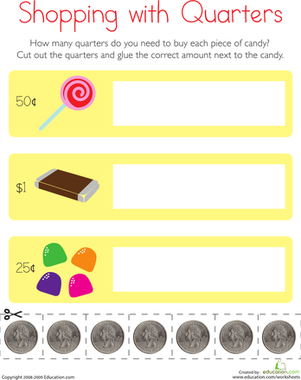 To shop for candy, kids read prices, count quarters, and match the prices to the equivalent amount of quarters on this first grade math worksheet. 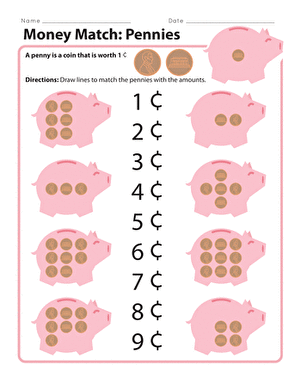 This worksheet lets your first grader play with money, while he practices counting and working with pennies.